At a time when refugees are requesting an urgent increase in assistance because they cannot cope with rising prices in one of the most expenses cities in the world, access to government welfare is becoming more difficult. 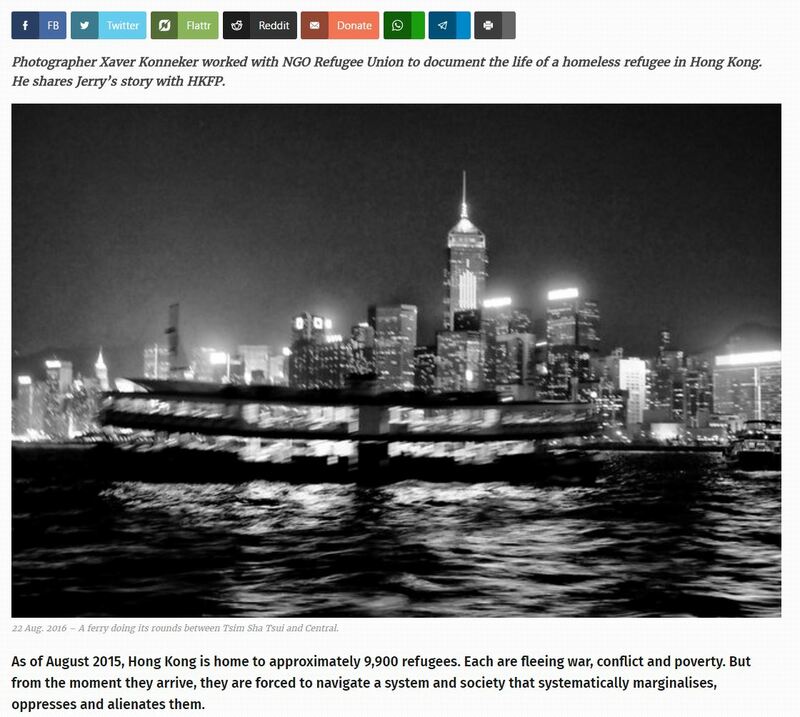 Refugees range from experienced veterans, who know how to obtain limited resources, to new arrivals, who are learning to cope with the multitude of challenges and failures of Hong Kong’s asylum sphere. In the latter group, unaccompanied, young, females often don’t enjoy a support network and might be unable to communicate in English or Chinese. If ISS-HK cared about refugees, such women would be swiftly lodged in secure shelters to protect them from the risks and dangers of living on the streets. That wasn’t the experience of one African 24 year-old woman who escaped a trafficking ring in Fuzhou, China, to seek asylum in Hong Kong. She fears returning to her country because the criminals who tricked her into travelling overseas to work as a domestic helper would make an example of her as a warning to other women who dared to escape. After filing a protection claim with the Immigration Department in July 2016, Elisa has been unable to rent a room for five months because the rental assistance was insufficient and her ISS-HK caseworker failed to identify and prioritize her vulnerability. 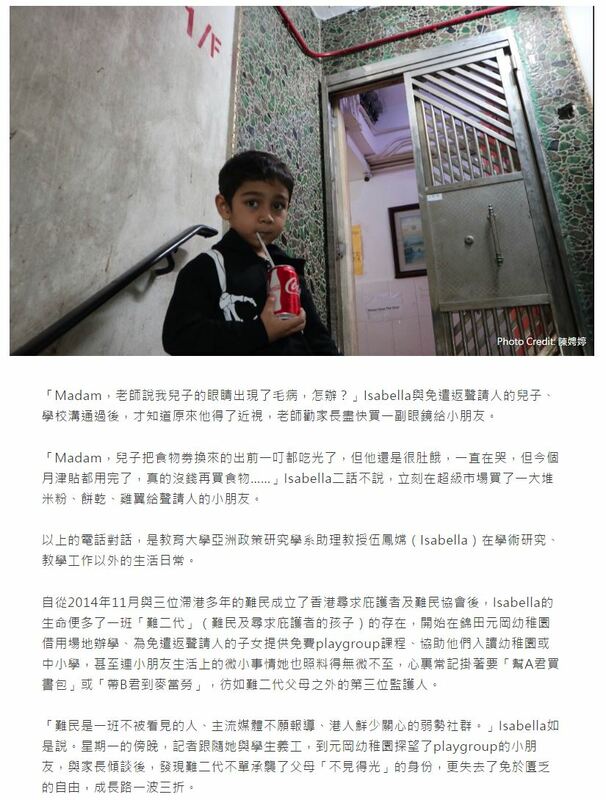 With the help of a more experience refugee, she signed a tenancy agreement for a small 4500$ room in Sham Shui Po. Elisa would be responsible for half the rent and she relied upon ISS-HK to pay the landlord 1500$ as customary. 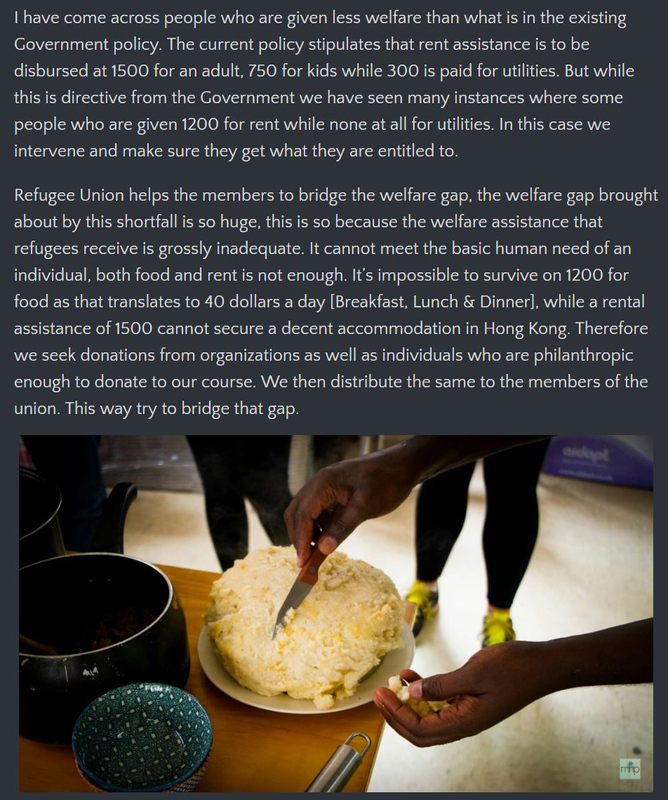 For the past ten years, refugees in need of rent assistance were required to identify a room/flat, negotiate the rent, possibly shared with others, and produce to ISS-HK a signed tenancy agreement, landlord identification, bank details and proof of ownership (to avoid unauthorized structures). Despite not speaking English, Elisa understood the requirements and adeptly met these conditions before approaching her caseworker with what she thought was a done deal. She was wrong. Instead of praising Elisa’s success following five months of homelessness, her casework threw another challenge at her by demanding she find a “Rent Guarantor” to shoulder the surplus – or else there would be no rent assistance at all! The impediment was such that Elisa risked losing the room she secured with great difficulty and the security deposit already paid to the landlord. 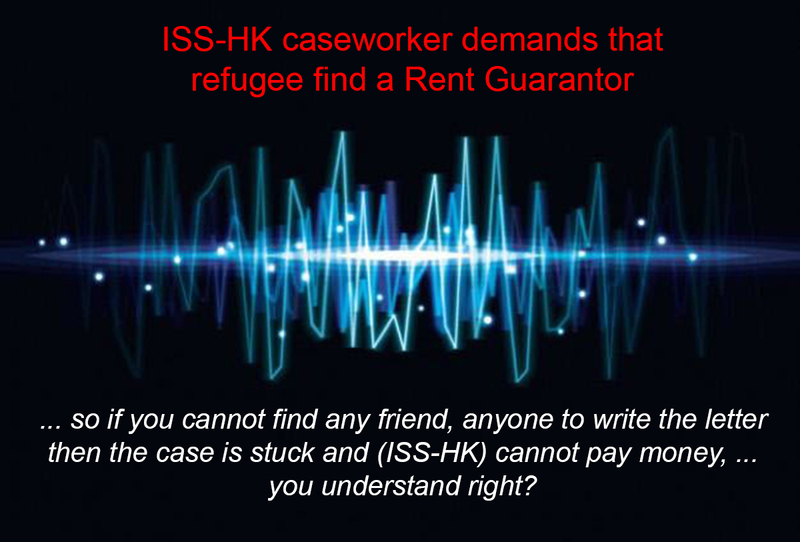 For reason that Elisa does not speak English, her ISS-HK caseworker placed a phone call to a refugee friend of hers to press the demand for a Rent Guarantor. The ISS-HK officer (name withheld) warned that if Elisa failed to find a private sponsor, then the basic 1500$ in rental assistance would be denied, despite Elisa being a young and vulnerable female victim of human trafficking. Vision First wonders if the caseworker’s conduct was lawful, although it was morally reprehensible and shameful. Caseworker: How about the other people (roommate)? Do they know who is helping with the extra money (rent surplus)? Jesse Wong: So she has to ask the roommate, right? Friend: She needs to ask the roommate … since last night I cannot reach him, so that is the problem. 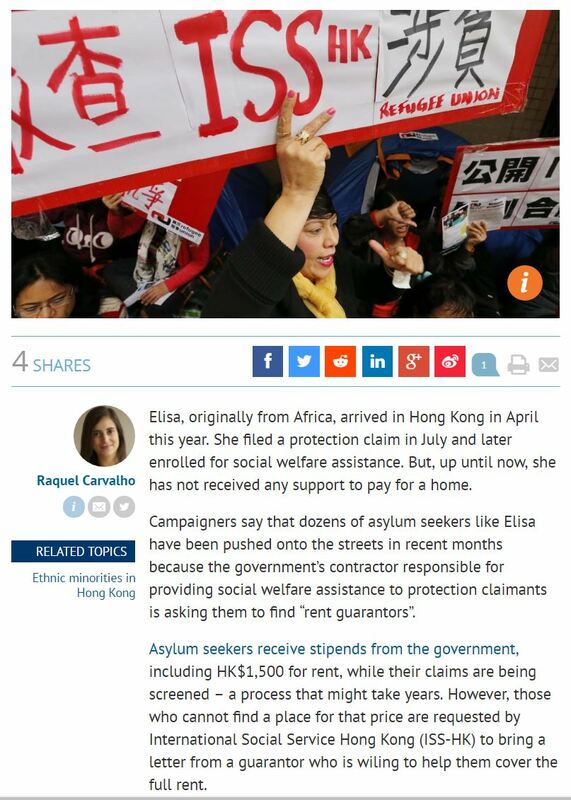 Caseworker: Because without the letter I … the case cannot be transferred to Kwun Tong (ISS-HK branch for Sham Shui Po where Elisa rented a room) … And we cannot pay money! Friend: OK, so in this case we need to call you later when we get the guy … we need to understand the case first. At the moment she cannot write any letter as she don’t know anything about that (how to get rent guarantor). Caseworker: … like this la … because I can only transfer the case after she writes the letter … so if you cannot find any friend, anyone to write the letter then the case is stuck and (ISS-HK) cannot pay money … you understand right? Caseworker OK, so please tell her and the roommate to try to find anyone who can help her with the extra money … and then you call me back, OK? Caseworker: Yeah, yeah and then if she can find another friend, the she can come to Prince Edward (ISS-HK branch) to write the letter again, OK? 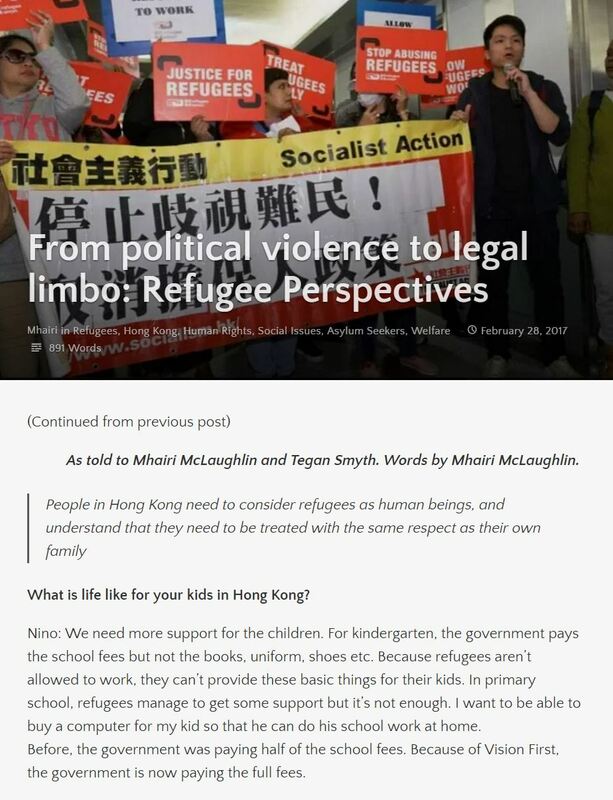 Vision First is outraged that ISS-HK is blatantly demanding that vulnerable refugees “find anyone who can help with the extra rent money” as a precondition to release the government assistance that the refugee community desperately relies upon. 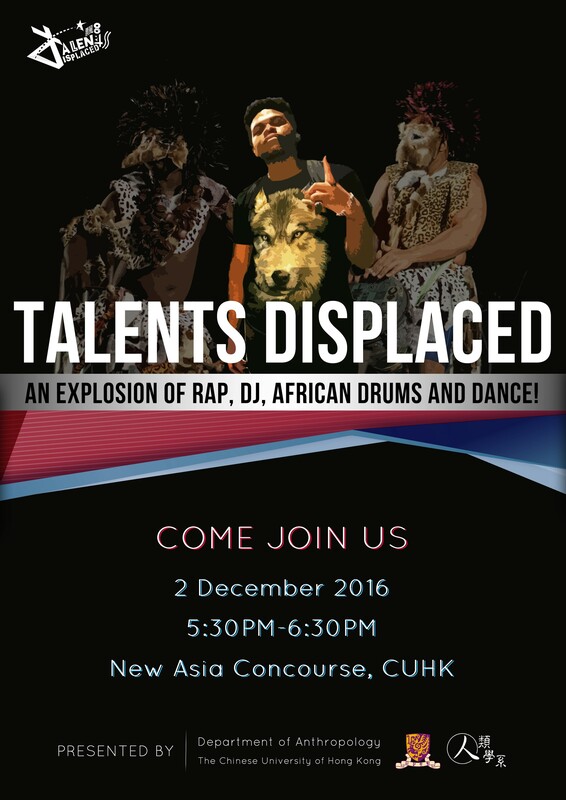 Like many others, Elisa is a displaced refugee unfamiliar with Hong Kong and has no resident friends. It is shameful that the contractor of the Social Welfare Department presumes that Elisa can raise money for rent when she has no money, has no support network and is barred from working under threat of 15 to 22 months imprisonment. It is highly regrettable that Elisa escaped trafficking in China only to be abused by the welfare system in Hong Kong. Here is a link to Vision First’s letter of 23 November 2016 to the Security Bureau on the disturbing problem of “Rent Guarantors”. 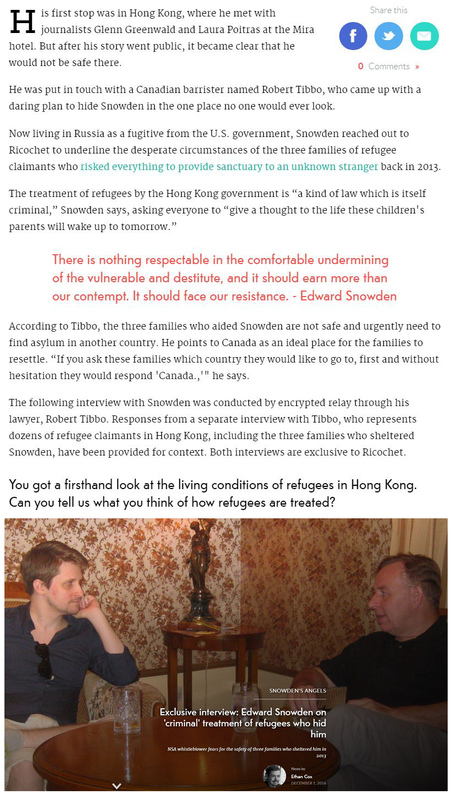 We have a legal and moral obligation to treat refugees with respect and clearly certain caseworkers at ISS-HK fail abysmally in this respect.